These are two distinctly different watersports. The canoe is an inflatable boat also known as the ‘hot dog’. You embark on a 2 person canoe with a double paddle each. You will follow the river bed and the qualified guide will accompany you and ensure your safety. The inflatable kayak is the same type of boat as the canoe but for a single person, it is also known as an ‘air boat’. You will be alone in the boat with a double paddle and a guide nearby. 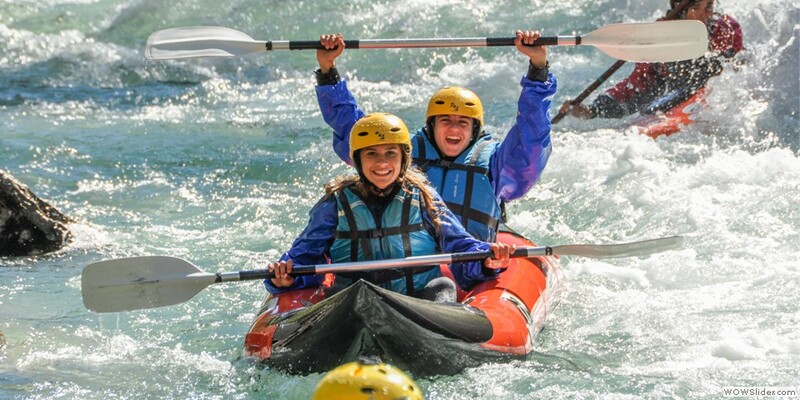 We propose for you on The Verdon (river class 3 to 4) different types of courses for you to choose! The following items will be at your disposal: canoe or kayak, paddle, lifejacket, helmet, wetsuit, neoprene jacket or windproof jacket and neoprene socks dependant on the season. THE CANOE/KAYAK IS FEASIBLE ONLY ON THE DAYS WHEN THERE IS SUFFICIENT WATER, IN GENERAL TUESDAYS AND FRIDAYS. THE RATE OF THE WATER IN THE VERDON IS REGULATED BY THE EDF DAM (Chaudane/Castillon). THEREFORE THERE MAY BE CHANGES TO YOUR RESERVATION.